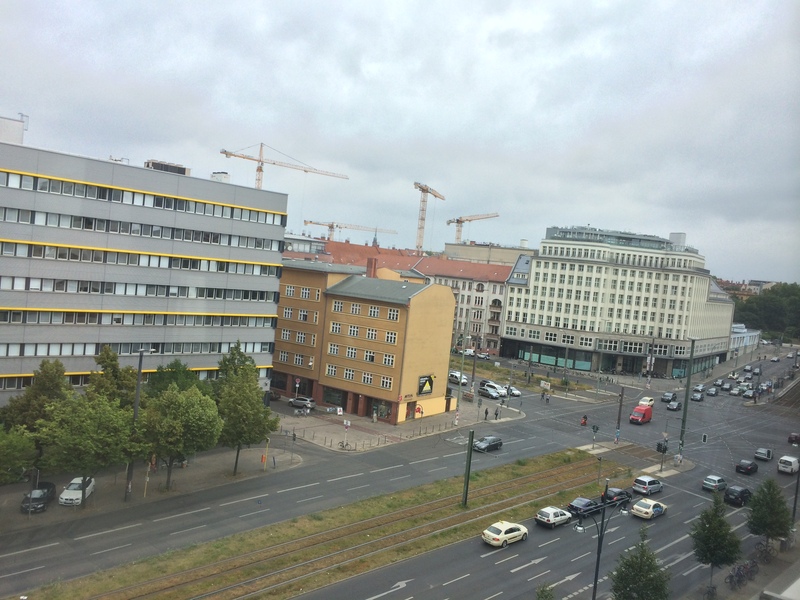 I sit in the 6th-floor bar of the Pangea People hostel and alternate between sipping my coffee and staring out the window overlooking Karl-Liebknecht Strasse, noticing how different things seem to be but simultaneously how much the same when compared with the U.S.A. The cold-cut breakfast (welcome to Europe!) satisfies my hunger but not my taste. I write until noon and leave the hostel for my walkabout. My rule for the day is just to walk wherever I want to walk whenever I want to walk there. I’ll take breaks whenever I feel the need, too. 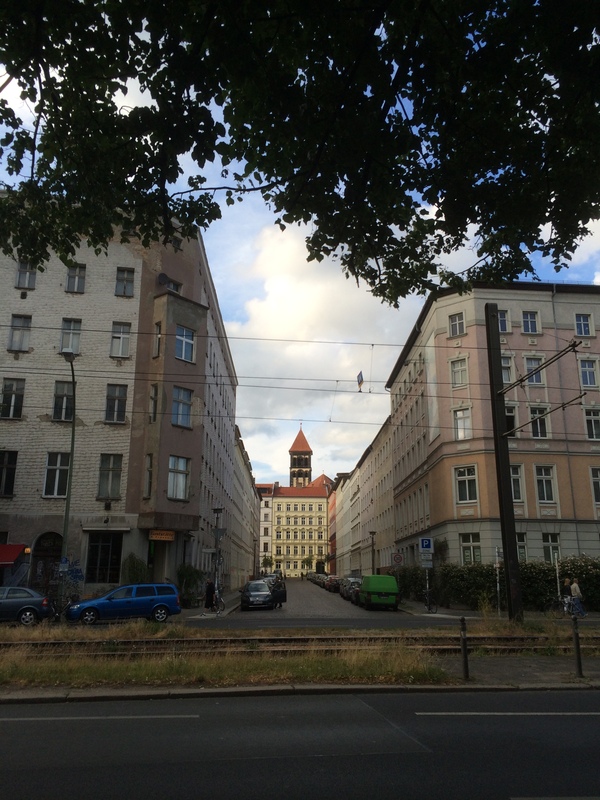 I start on a westerly tack on Torstrasse and stop continuously to look at the architecture along the north side of the street, at one point noticing a church steeple visible as I look along a cobblestone avenue running northward from the main street. Following my principle, I turn up that road and head toward the church. I learn its name: Zion Church. I learn, too, that it was home to an underground press that printed anti-communist propaganda during the Cold War. This was East Berlin, of course, and it was a controversial activity. Communists aren’t big on religion to begin with, and it’s surprising to me that such an operation was able to continue for any length of time. Pretty neat. The church itself is under re-construction, so I don’t go in. I press west toward Bernauer Strasse, where there are some bits of the Wall left standing. When I get to Bernauer, I wander along the tourist route following the old east-west divide for die Mauer (“the Wall”). I stop at the information points, read the placards, and work out German-to-English translations of individual sentences on the signs. My German is only passable right now so long as the person to whom I’m speaking says precisely what I expect them to say in response to my pre-planned questions and salutations. One of my main missions for the trip is to improve this standing. I wander south toward the center of town and the River Spree, and I pass one of Berlin’s beach bars as I go. Though closed now, it advertises public viewing of the World Cup matches at this location. This is a common thing: Berliners watch much of the World Cup in the company of thousands of other fans at sites all around the city. I have heard that the Tiergarten hosts dozens of thousands of fans every night. Sounds like a good time. I walk along the Spree under some overhanging trees. There’s a tunnel with a saxophone player intoning jazz melodies, and outside the tunnel there are two men playing accordions for beer drinkers at riverside cafes. 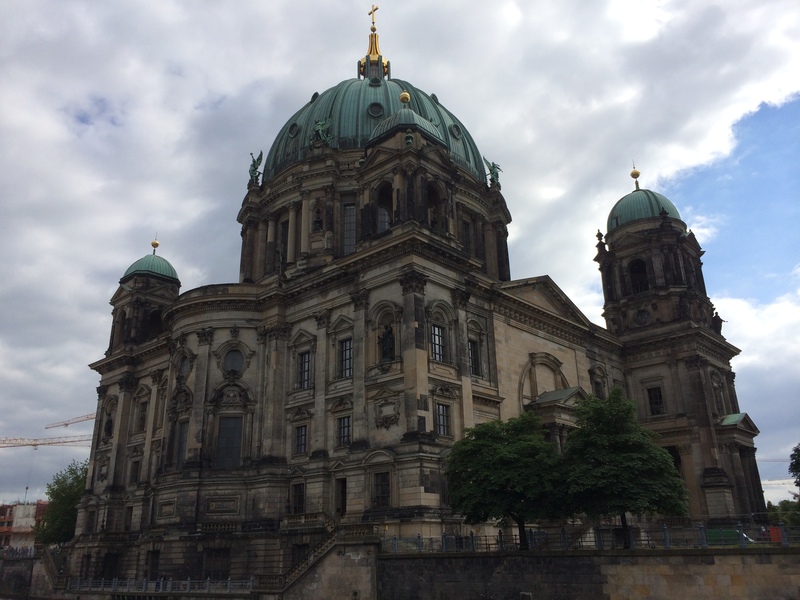 There’s a beautiful view of the domed church at the northernmost point of Museum Island. I visit a university bookstore just before reaching Karl-Liebknecht Strasse. There will be more bookstore visits before I leave this city. Today I walked for six hours and wrote a lot. It was a good day. 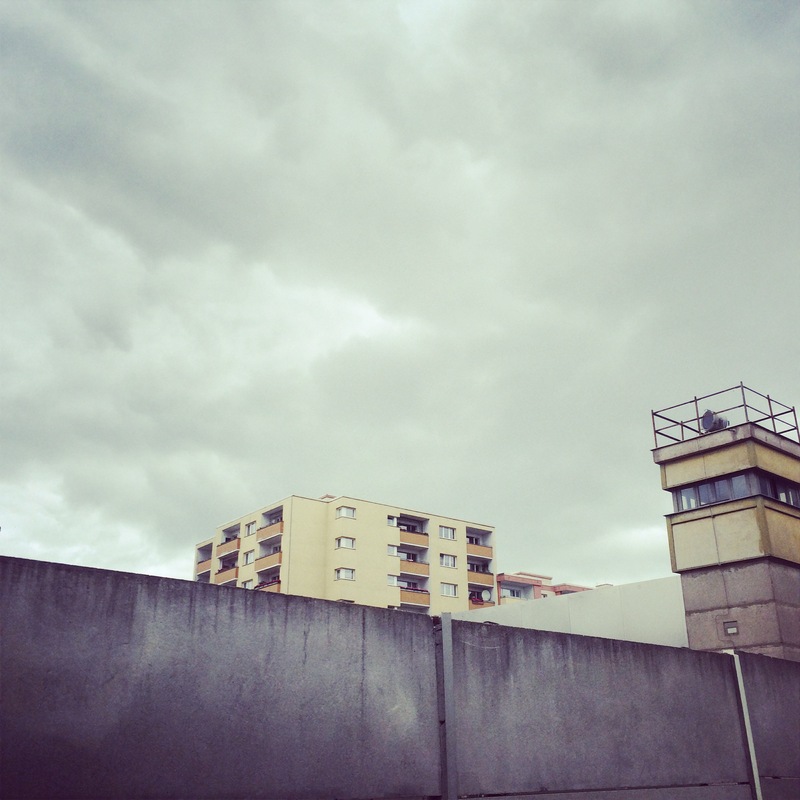 This entry was posted in Travelogue and tagged Berlin, Culture, Die Mauer, Slow Travel, The Berlin Wall, travel, travelogue, Walkabout, Walking. Bookmark the permalink.